Apparently my husband and I are pretty good at making cob dip, where there is a delicious dip in the middle of a cob loaf that you scoop out with bread, carrot sticks and celery sticks. We made it once at a party, and we developed a reputation for it, so we decided to make it again for our friends at a board games night. It turned out so well that I thought I would share the recipe with all of you! I guarantee it’s delicious! Cut 4cm off top of cob loaf to form lid. Hollow out the centre of the loaf by scooping out the bread, making sure to leave a thick enough rim around the bread, as well as at the bottom of the loaf. Squeeze out any excess moisture from spinach before combining with the cream cheese, sour cream and soup mix in a large bowl. Season with salt and pepper as desired, but I strongly recommended avoiding adding must salt, as this is a pretty salty mix already thanks to the French onion soup mix! Spoon the creamed mixture into loaf and replace the lid of the cob. Place on prepared tray and put in the oven to bake for 20 minutes or until golden. Serve with cut vegetables and extra crackers if desired. And there you have it – super simple and really versatile if you want to change it up for your own entertaining. 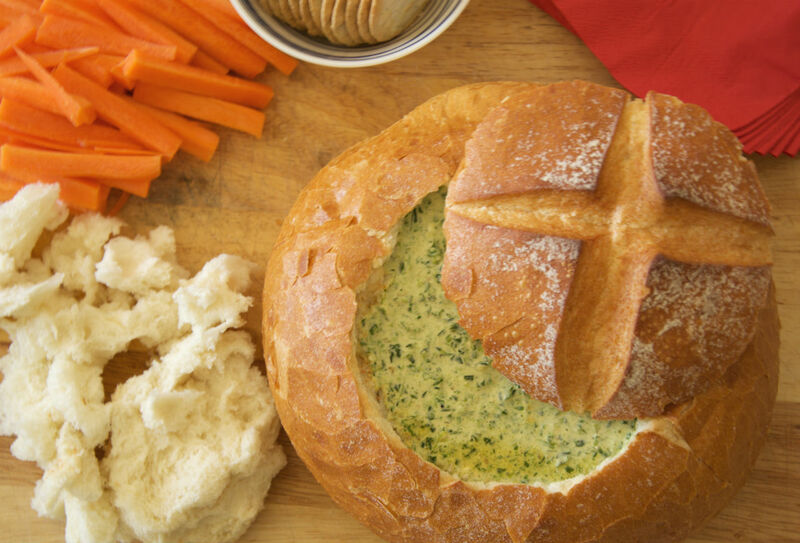 You can add a different soup mix, or even go for a hummus based recipe, or go all out and mix your cheese fondue party in with your cob loaves if you want! Let me know how it goes in the comment section below.